UPDATED: Mon., July 31, 2017, 8:40 p.m.
A pulp mill planned for southeastern Washington will extract cellulose from wheat and alfalfa straw, turning a waste product into a commodity. Columbia Pulp LLC will begin construction on the $184 million project on the Snake River in August, with production expected by late 2018. The pulp mill has been more than a dozen years in the making, said John Begley, Columbia Pulp’s chief executive officer. When farmers burn their fields after harvest, they have to get permits from the state Department of Ecology. About $500,000 of those fees supported research on the pulp-making process that began at the University of Washington, department officials said. In 2014, Washington farmers burned about 400,000 tons of straw residue, according to the Department of Ecology. Burning the fields emitted 556,000 tons of climate-warming carbon dioxide. Because the oxygen is already in the air, the carbon dioxide emissions are larger than the tonnage of straw residue burned, department officials said. Turning the straw into pulp will reduce air emissions, Begley said. In addition, the new pulp-making process is less polluting than the traditional kraft process of turning wood chips into pulp, he said. The new technology uses less water and fewer chemicals, and no wastewater will be discharged to the Snake River, he said. The new mill won’t emit the rotten-egg sulfur smell often associated with pulp mills, either, Begley said. About 90 people will work for the mill, which expects to pay about $9 million annually in payroll and benefits. Hiring will begin next summer. Financing for the project comes from the Washington Economic Development Finance Authority’s issuance of $133.6 million in tax-exempt bonds, which were sold last week by Goldman Sachs. Columbia Pulp will use the mill’s earnings to pay off the bonds. The company also raised $54 million for the new mill through a private placement. Columbia Ventures Corp. of Vancouver, Washington, purchased $36 million of the private shares. 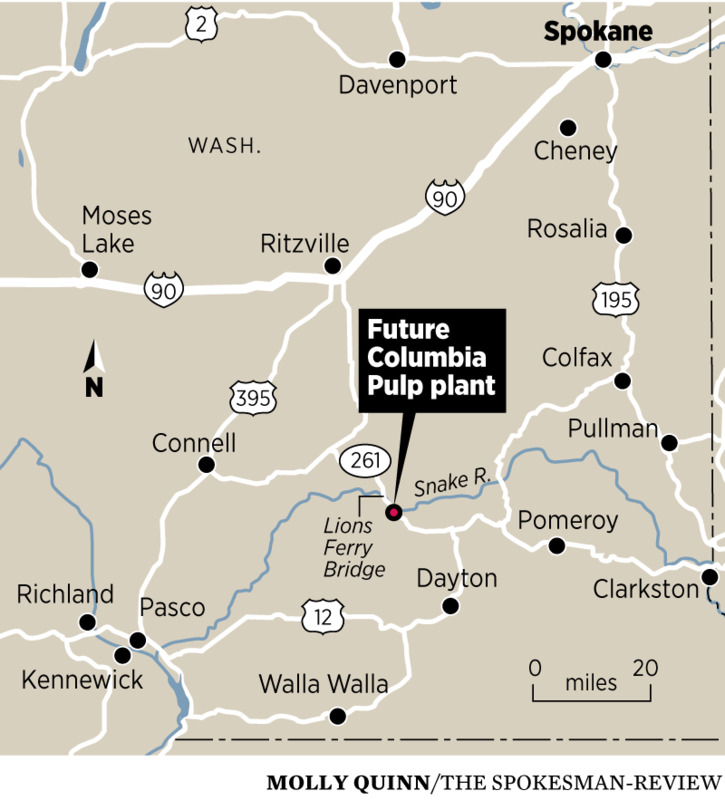 Columbia Pulp is buying 449 acres at Lyons Ferry on the Snake River for the pulp mill. The company needs about 40 acres for the mill and will manage the rest of the land as a buffer. Wheat farms within a 100-mile radius of the mill produce about 4 million tons of straw annually. Mill operators expect to buy about 240,000 tons each year. Alfalfa seed crops grown in Walla Walla will provide another local source of straw. Begley, who previously worked for Weyerhaeuser Co., said the straw-based pulp will be similar to pulp made from hardwood trees. It could eventually end up in tissue products and molded fiber products, such as paper plates and take-out food containers, Begley said. Published: July 31, 2017, 8:02 p.m. Updated: July 31, 2017, 8:40 p.m.